The grande dame of British cheese influenced countless cheese lovers. Fifteen years ago, I took a trip to England for a comprehensive tour of the origins of the best British cheeses. I visited Wensleydale in North Yorkshire, then the village of Colston Basset to learn about Stilton and the West County for an education in Cheddar. But it was a trip to Bath, nestled in the countryside of southwest England, where I was taught my most life-changing lesson. Bath is a picturesque village dating back to the Roman Empire, celebrated for its verdant hills, Roman Baths and 7th-century Abbey. After going on a walking tour my first day there, I was taken by a friend straight to The Fine Cheese Co. cheese shop. It’s a warm, charming store filled with beautifully curated cheeses, with a small cheese-focused café attached. We sat down for a fresh, satisfying meal; the service was spectacular. After our early dinner, I was introduced to the shop’s owner, Ann-Marie Dyas. She gave me the grand tour and generously allowed me to taste as many cheeses as I wanted. I quickly realized that whichever cheese I chose was at its peak ripeness, no small feat for a cheese store of that size and scope. I tried white bloomy-rind cheeses, washed-rind cheeses, hard cheeses and a selection of fantastic blues: every single one was perfect. In addition, Dyas knew the answer to any question I asked about any of her offerings. I was amazed at her passion for her work, the breadth of her knowledge and her reverence for the cheese. What’s more, she was jovial and funny, with a smile a mile wide. I’d never encountered anyone quite like her. As I left Bath the following day, I couldn’t stop musing on Ann-Marie’s love of cheese. I realized I needed to up my game if I wanted to become a serious cheese guy. In the following months, I deepened the specificity of my knowledge, spoke to as many cheesemakers as I could, took a refresher course on how to care for cheese, and ate as many different cheeses as I could get my grubby little paws on. Ann-Marie had rekindled my own passion. Fast forward a few years: after much discussion and a ton of hard work on my end, I convinced Ann-Marie to let me be her broker in America. Then just last year, we became full business partners in exporting American artisan cheeses to the UK through our American Originals selections. This partnership is something I’m incredibly proud of, not only because I was able to realize a lifelong goal of exporting great American cheeses, but because I was fortunate enough to do so with Ann-Marie and her wonderful husband, John Siddall. Which brings me to the present: earlier this month, Ann-Marie passed away after a long and daunting battle with a very difficult illness. I’m so honored to say she was my client, my business partner, but most importantly, my friend. Her husband John has vowed to stay true to her spirit as he takes over their multiple enterprises, continuing to bring the best cheeses and crackers to over 40 countries around the world. Ann-Marie certainly influenced and inspired me, and – without any doubt – countless others in the specialty food industry. 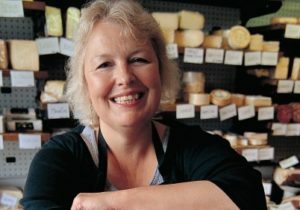 She was the beloved grande dame of British cheese, and will be missed for her wit, her brilliance, and her passion for cheese and life. My one solace: the idea that everyone in heaven is now eating great cheese. Read the full story on The Daily Meal or The Baltimore Sun. Tags: American Originals, Ann-Marie Dyas, Bath, British Cheeses, Specialty Food Association, The Daily Meal, The Fine Cheese Co.